A relatively large faculae field rotated over the Sun's east limb on 8 and 9 July. Faculae are local concentrations of magnetic field at the solar surface, but they are not strong enough to form sunspots. As such, they appear as brighter areas on the solar surface, in particular near the solar limb. In this case the faculae field near the east limb was the remnant of sunspot group NOAA 2713, which had decayed during its farside transit. No surprise then that the faculae field initially appeared spotless. 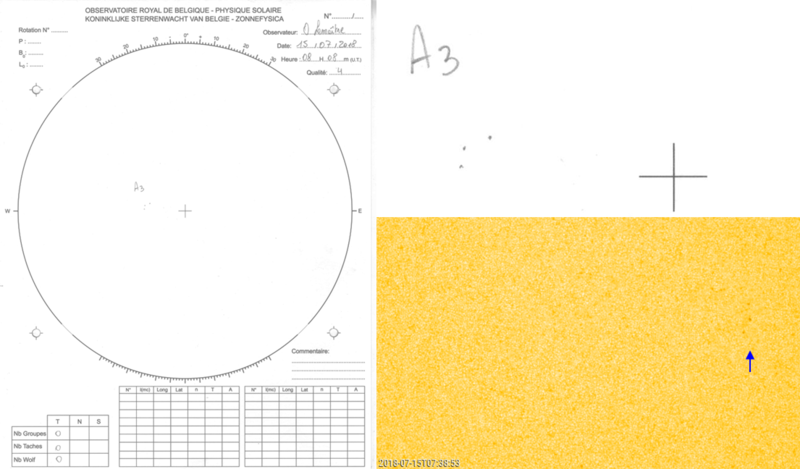 The figure underneath shows the bright spotless faculae field on 10 July (left) and the same field on 14 July when it was near disk centre. On 12 July, SDO/HMI imagery showed the development of some greyish features in both the leading and trailing portion of the faculae field. These are called pores, with some of them indicated by blue arrows in the image above (right). Solar pores are small premature sunspots, representing intermediate sizes (about 1000 km) between small-scale magnetic elements and mature sunspots. Unlike a normal sunspot with distinct fine structures in both the penumbra and the umbra, a pore has a simple magnetic field configuration with a strong vertical magnetic field and no penumbral structure. Pores are usually identified by their low continuum intensity, about 20%–80% of the surrounding photosphere intensity (sunspots are even darker, about 10%). A pore usually decomposes into individual magnetic elements within a few hours and in some cases grows by the accumulation of the surrounding magnetic elements. In this case, there seems to have been a continued emergence and decaying of pores in the leading and trailing portions of the faculae field, without actually evolving into a mature spot. In the imagery above (SDO/HMI 4K images, i.e. highest resolution! ), one can see these pores evolving, but even the darkest ones do not last for more than about a day, and most pores are gone after only a few hours. The pores were not visible in small telescopes, but solar observers using somewhat larger aperture telescopes (12-15 cm openings and higher), were able to see them. 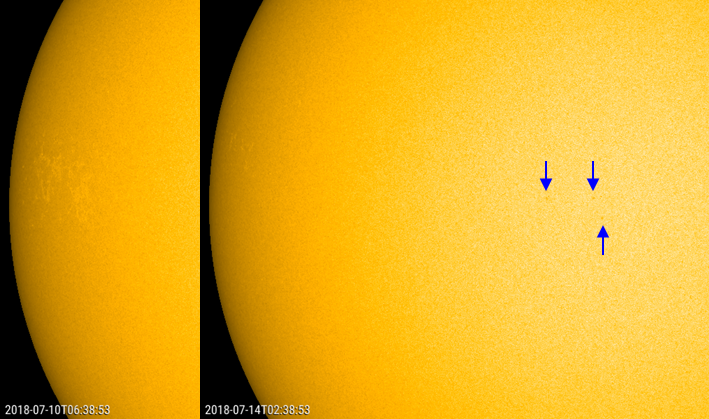 As pores were visible for several days in the same areas of the faculae field, some observers such as at USET justifiably reported a small sunspot group from 13 till 15 July. See compilation underneath - note the USET drawings (and zoom) are mirror-reversed. Further reading - The descriptive definition of the pores was taken from Cho et al. (2010): Tiny pores observed by HINODE/Solar Optical Telescope. The animations of the pores' evolution were created with JHelioviewer. Dr Frédéric Clette (SILSO) had some additional comments on the difference between pores and sunspots: "Next to the lower contrast of such tiny pores, those weak pores have also fuzzy outlines, while even tiny sunspots (without penumbra) have sharp boundaries. In the movie, the flickering of those pores illustrates well the short lifetime of those features and also their randomness. This random character indicates that they are still dominated by the random convective dynamics and are thus mostly local (extreme) fluctuations of the general convective pattern, while sunspots are characterized by the dominance of magnetic fields which take control and block the convection and its ephemeral character, leading to a more stable and durable feature."